Many people are not very proficient in Conceptual Thinking. Perhaps because it is nowhere taught. 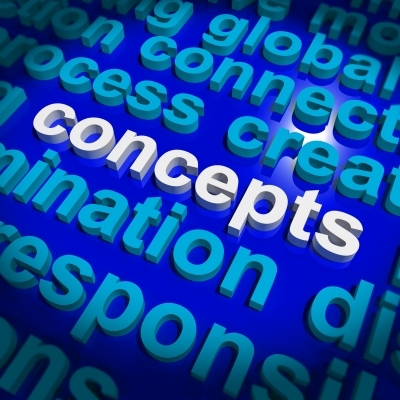 Conceptual Thinking is thinking with the aid of concepts. Some people describe it as the ability to effortlessly walk up and down the ladder of abstraction. 2. Something formed in the mind; a thought or notion. See Synonyms to idea. 3. A scheme; a plan. A concept could also be a underlying principle, or a class of features. Examples of daily concepts are doing the dishes, driving home,cleaning the house, brushing your teeth. These concepts are rather easily to describe. But it is more difficult to describe more abstract concepts: restaurants, hotels, offices, building, tour operator, police officer, traffic light, a store, a prison, a library, a market, Wikipedia. Most concepts can be defined in two or three sentences, however, that will need some hard thinking. But it is sufficient to summarize what it is for, how it assumed to function and what makes it sensible. Concepts refer to underlying things, events, behaviors and embodiments. It is something like a container. We get rid of a lot of non-relevant details. The other way around, if we are able to describe concisely a concept, we are able to forecast things, events, behaviors and embodiments. A three menu restaurant or a three star restaurant are all different concepts, as a cafe is where a simple meal is served for cost price. The bar owner’s business concept is that his turnover comes from both, serving guests a meal has the only goal to let them stay longer. Supposed the bar owner knows his concept well, what can we forecast? There are very few tables in order to create waiting time for dinners. If a group enters the bar, and announce that they will have a meal, and a couple enters a considerable time after the group, the couple will be served first. Because it is more lucrative for the turnover to let wait a group at the bar (drinks) than the couple. The concept of a three menu restaurant is to have few standardized receipts and supplies and no advanced cooking skills needed, compared with a three star restaurant. McDonald’s operates a complete different concept of a restaurant. Sometimes in identifying a concept, it helps to contrast it with another, more familiar concept. Starbucks is a different concept than that of a normal cafe. What is the difference? Even more difficult are concepts that only exist in our brains. A state, social welfare, the internet, water management, war, health, health care, globalization, climate change, intellectual property, education, academic study. Or new business models, like those for internet browsers, on-line music shops, video channels. How does these work, how do they generate money, what value provide they? However, extracting concepts is a powerful way to think clearly and to search for alternative or rivaling concepts to solve problems and designing new possibilities. Some exercises on Wikiversity about building concepts: look here. Conceptual Thinking, Design Thinking, Critical Thinking and Creative Thinking are all topics in our books on Thinkibility.